Thanks to the huge success of 'Pappy' Gunn and his transformation of normal B-25C Mitchells into lethal gunships for use in New Guinea, North American decided that it would be a great idea to provide a factory produced gunship, and so there was a new nose developed for the B-25J that contained no fewer than 8 .50 cal machine guns. When you add on the side gun packs and include the upper turret, that made a total of 14 forward firing 50s. All this and you still had the use of the bomb bay for carrying bombs should the mission require it. To say that these aircraft created havoc wherever they operated would be an understatement as whatever was on the receiving end of that much firepower was thoroughly trashed. This was especially effective in the jungles of the Pacific where the guns would cut through vegetation like a knife to lay open what was beneath. Interestingly, this concept seemed pretty much limited to Pacific and CBI theaters as I don't recall reading much about these aircraft being used in Europe. Once the war was over, many of these planes that were not scrapped had standard bomber noses attached or were converted to TB-25 crew trainers. This is a reboxing of the Hasegawa kit "Gun Nose II" or something like that, but with Revell's instructions and different decals. 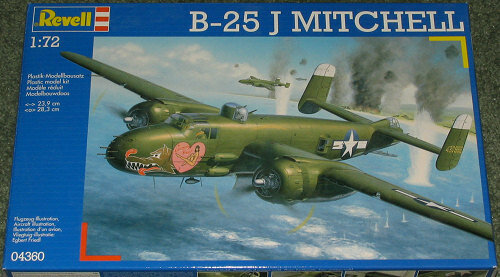 There is 99% commonality with the standard B-25J kit with a couple of exceptions. One is that there are no clear transparencies provided for the normal bomber nose. The other is an additional sprue for the gun nose and its guns. 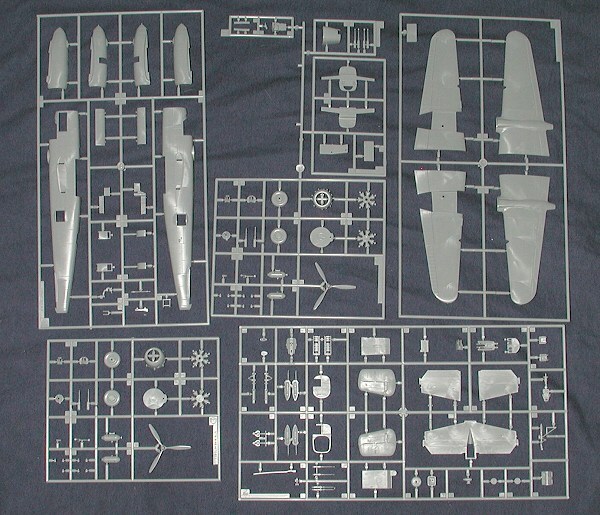 The image of all the sprues is for the standard J with the smaller image of only the gun nose. I can tell you that this will make into a very nice model. I thought the glass nosed J, reviewed here, was a superb kit with few problems and the resulting model is one of my favorites. Of course, I like the B-25 anyway and have probably built more of those in kit form than any other bomber. This boxing, besides being about $10 cheaper than the Hasegawa kit, also has instructions that are a bit more comprehensive that what you get with Hasegawa. Of course, that is tempered by having only Revell paints provided as references, requiring mixing to get some of the standard shades that are provided with other paint lines. Fortunately, you can pretty well figure out what these shades are and the others are provided a generic name to help. Markings are provided for three aircraft. One is the box art plane from the 38th BG based in Japan during December 1945. I only hope they were not still bombing Japanese shipping three months after the end of the war. Second is from the 345th BG in the Philippines during May of 1945. This unpainted metal aircraft is the same markings as one finds in the older Monogram 1/48 B-25J The yellow on the nose of this one has to be painted prior to the installation of the decals. Finally, a Dutch B-25J from 18 Squadron, also in unpainted metal, when based in Balikpapan, Dutch East Indies during the post war rebellion that eventually created Indonesia. The decals are quite nicely printed in Italy and should work well on whichever scheme you choose. What can I add? It is a superb Hasegawa kit with different decals and it is about $10 cheaper. No brainer on this one. If you would like your product reviewed fairly and quickly by a site that has nearly 350,000 visitors a month, please contact me or see other details in the Note to Contributors.